In Los Angeles, Showcasing A City That Might Have Been A exhibit at L.A's Architecture and Design Museum focuses on eye-popping buildings and structures that were imagined for the City of Angels — but never actually built. Pereira and Luckman, Los Angeles International Airport Original Plan, 1952 — The original design for LAX had a single, centralized terminal under a glass dome, a plan which was nixed by both the airlines and city engineers. 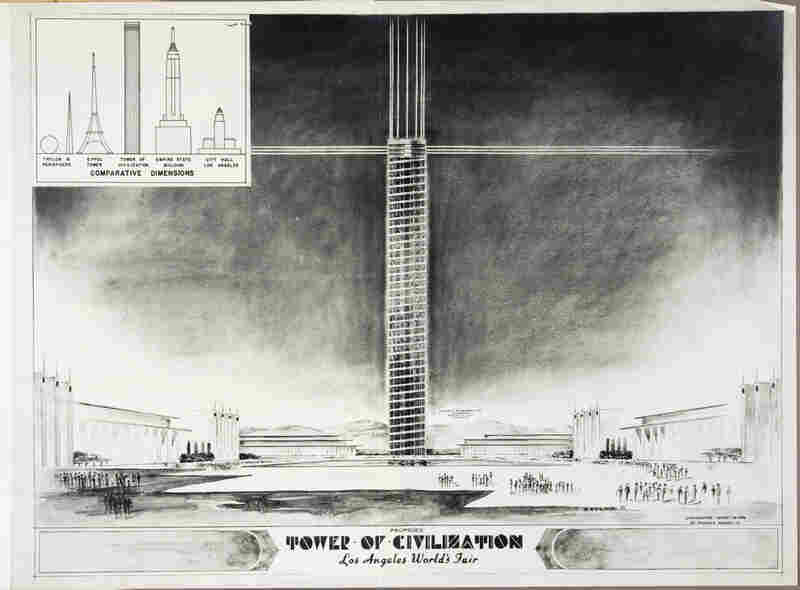 William H. Evans, Tower of Civilization, 1939. At 150 feet in diameter and soaring 1,290 feet, the tower would have been the tallest structure in the world at the time. Frank Lloyd Wright, Huntington Hartford Sports Club, 1947. The planned 130-acre hotel development would have been a few blocks off Hollywood Boulevard. 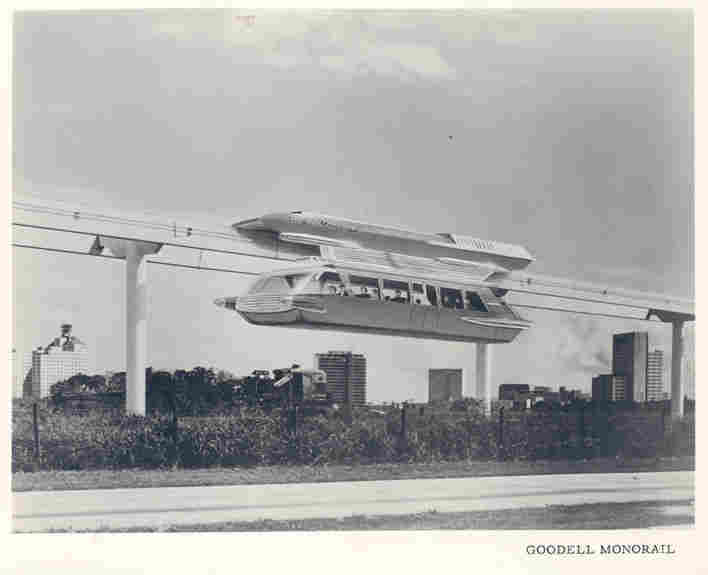 Goodell Monorail, 1963 — The coaches on the proposed monorail took design cues from the Cadillacs of the time. B+U, Firestone Mixed-Use Office Building, 2009 — A mix of offices, retail shops, a cafe and a plaza, this building would have been covered by braided fabric at different levels of transparency. The project went down with the economy. 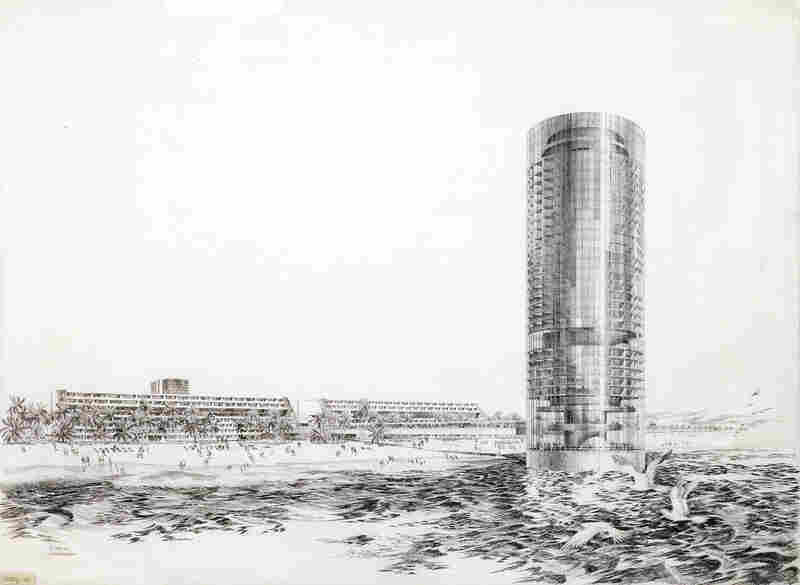 DMJM, Pacific Ocean Park Redevelopment, 1969 — The designer proposed a 30-story hotel situated 300 feet offshore. It would have had a glass-enclosed bridge to connect it to land; alas, it fell victim to real estate negotiations. 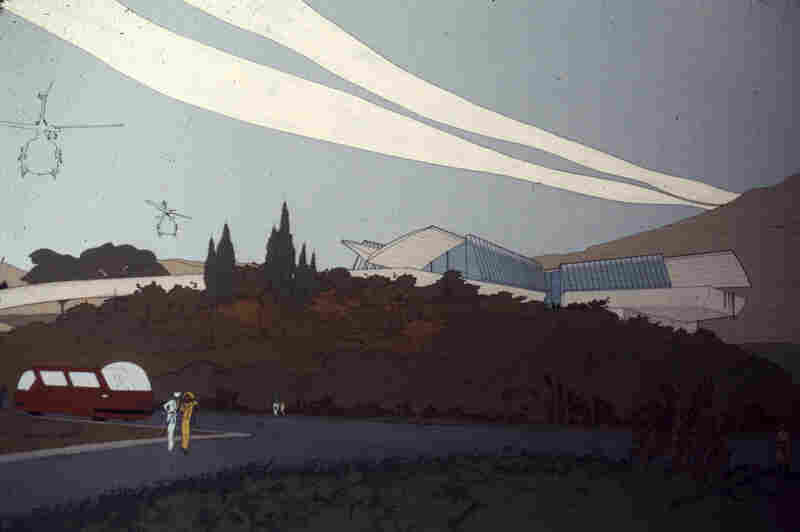 John Lautner, Griffith Park Nature Center, 1972-1974 — In this painting of the proposed center, Lautner was at pains to how the building was inspired by land and sky. 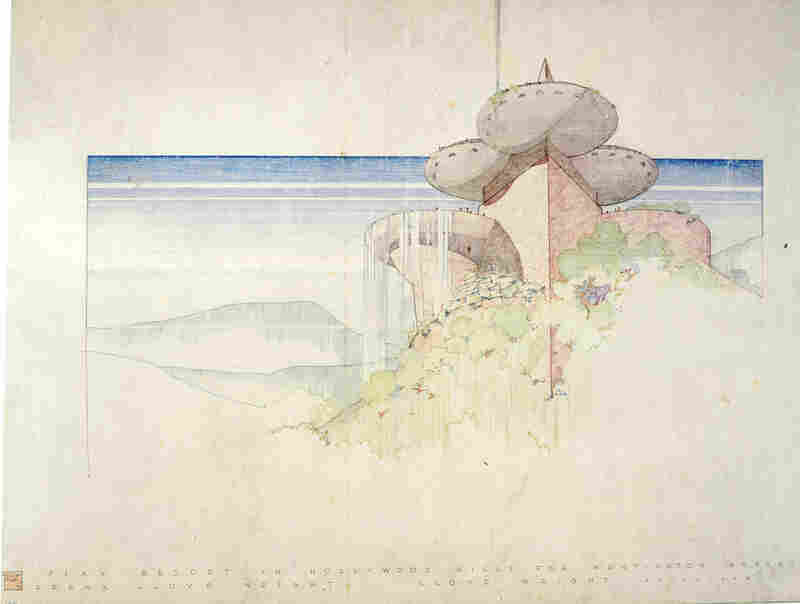 Lloyd Wright, Civic Center Plan, 1925. Lloyd Wright's competition entry for the Los Angeles Civic Center put rapid-transit throughways under the city and gave pedestrians right-of-ways on broad terraces. A museum exhibit about buildings that don't exist might not sound all that exciting. 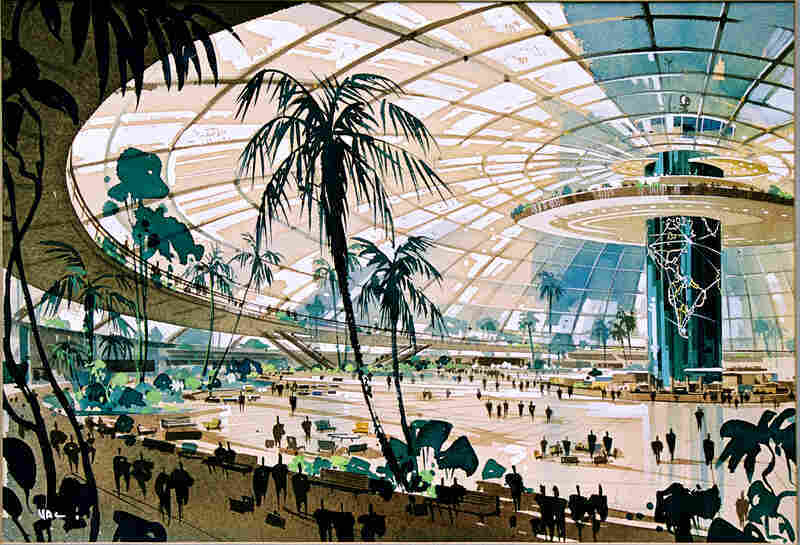 But the Architecture & Design Museum in Los Angeles has had its crowds grow to 10 times their normal level for a show called Never Built: Los Angeles. It's on through Oct. 13 – and it's all about projects that were imagined for the city but never constructed. Let's start with one of the most high-profile: a 1968 proposal that would've dramatically altered the profile of Mount Hollywood. "The pinnacle of Mount Hollywood would've been shaved down by about 30 feet," says exhibit curator Greg Goldin. "They would've flattened this natural peak, and on top of that would've been a star-shaped museum. And then of course a revolving restaurant, because revolving restaurants were the big thing, and an aerial tram to get you up to this Hollywood museum." Don't think La La Land is the only place where such imaginative projects have been conceived but never brought to birth. In fact, various museums have staged other "Unbuilt" exhibits in Chicago, Washington, D.C., and Berlin. And another such show just opened in San Francisco. "When we look at unbuilt projects, we see so many ideas, so many alternatives," says architecture critic Martha Thorne, a Pritzker Prize jurist who brought together the projects featured in the Chicago show back in 2004. "It helps us realize that there's not just one path that a city follows; there's not just one path that architecture follows." 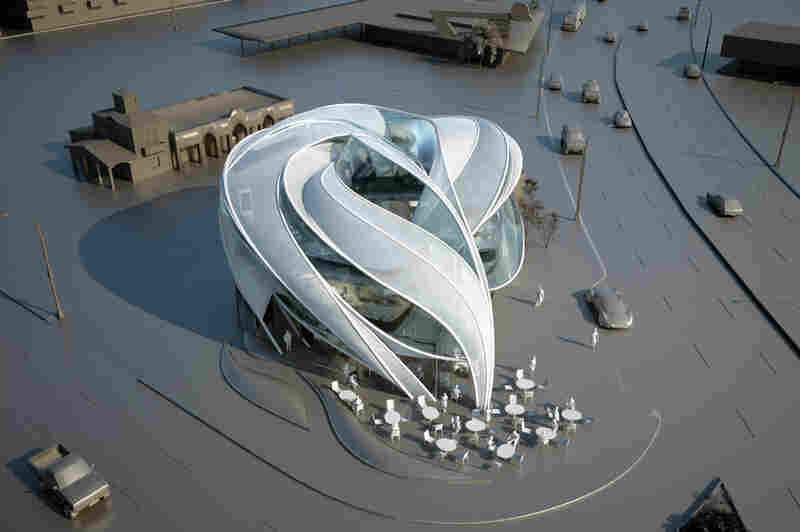 The "Steel Cloud," which won a design competition aimed at creating a monumental Los Angeles answer to structures like St. Louis' iconic arch and the Eiffel Tower, was designed by Hani Rashid and Lise Anne Couture. One path Los Angeles did follow – along with many other major cities — was to put a gaping freeway trench right through the heart of downtown. That urban scar would've been the site of another project called Steel Cloud. It was to have been a monster of a structure that covered the 101 Freeway and extended 10 stories up, completely transforming the area. "I think the Steel Cloud would've been great," says Goldin. "It would've had an aquarium. Two aquariums. Its scale was monumental. What was it called, a grasshopper?" It was called that, and probably worse. Designed in 1988 by Asymptote, the Steel Cloud was envisioned as a massive, 1,600-foot-long tangle of girders and struts spanning the highway, an angular insectoid agglomeration with not just aquariums built in and on it but parks and libraries and cinemas, with "LED screens flashing messages to motorists and a 'Musical Forest' synthesizing the rushing sounds of cars," according to exhibit text in a companion app for iPhone. "There are all kinds of pejoratives that were used to describe the Steel Cloud. And yeah, it was messy — but frankly it would've been amusing, you know, to have an aquarium hovering over a freeway in downtown," Goldin says. "Great, why not?" Exhibit co-curator Sam Lubell says lots of folks who've visited the museum have asked him what they themselves could do to make sure cool projects get built. "There has to be pressure to not let the powers that be shrug [these things] off as sort of ridiculous," he says. "If we can encourage people to not give up on projects that they believe are going to change the city for the better, that's important." Lubell mentions a proposal floating around right now to transform the concrete-lined L.A. River into a vibrant waterfront. He hopes those plans don't end up in a future exhibit about what could've been.